Are Democrats afraid of Sanders’ appeal in the state? Surrounded by hand-made signs announcing “Hey Debbie We Want More Debates,” “Latinos for Bernie,” and “Thirty Years of Truth,” self-described socialist and Democratic presidential candidate Bernie Sanders delivered a flat speech to a group supporters at University of Colorado, Boulder’s Potts Field over the weekend. A crowd of “thousands”, as described by CNN‘s Poppy Harlow, delivered half-hearted applause as the candidate laid out meaningless platitudes, usually in one-sentence soundbites. The tired talking points of corporate greed, expensive medicine, and big donors all working against America predictably featured throughout his speech. He also made sure to carve out some time to discuss gun control, and to deliver a Colorado-specific slant on his message, stating that gun crimes “put your state on the map nationally in a way that you did not want to happen.” He followed that with the claim that there is “widespread support to ban semi-automatic assault weapons.” He should probably check the Colorado polling on that. 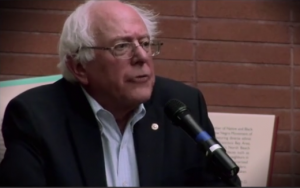 Sanders’ gun control remarks at CU may be part of a wider strategy to shore up a weak spot (in the minds of liberal primary voters) in his resume regarding gun control. The truth is that the Vermont senator actually voted against the Brady Bill and also supported measures to limit the liability of gun manufacturers in law suits brought by victims of gun crimes. It is likely that Hillary Clinton may try to differentiate herself as a more strident gun confiscation advocate. Imagine that, the top two candidates for president from the Democrat party are trying to out maneuver each other to prove to their voting block that they are the one who is most stridently anti-Second Amendment. Coloradans need to keep that in mind come November 2016.